Home/Forums/Support/Do I ought to pick a plan? I have two micro appliances up and running perfectly fine. I picked them up using the Amazon Marketplace where it says that the cost was 0.02 per hour. Today I enabled S3 backups in the Hub for both of them for the cost of pennies (pretty good!). Now the dashboard suggests (obligue?) to pick a plan to complete some 37% of my tasks remaining. What should I do? Am I on trial period? To be honest I'm quite happy with the things I've got now. Is it ok to leave it as is? Or am I going to be charged extra in, say, 15 days? It is unclear to me. Are you referring to the meter located at the bottom of https://hub.turnkeylinux.org/start ? Mine says "40% next step add an amazon ec2 account" Since I'm only using the turnkey linux appliance on my own server, i won't be adding an ec2 account. It is my understanding you're not obliged to take advantage of the extra features. To my knowledge, there is no trial period. The price you pay for the backups on S3 is fixed. The price you pay on EC2, you gotta watch. You will get billed for amazon for however long you use the EC2 instance. I think they bill once a month. If you got a trial period through amazon for free 1 year of a micro instance, then that would be the only trial period I know of. I ran a medium instance, forgot to shut it down, and cost me $50! We've been invoiced by Amazon for just last month S3 TK backup usage. So far so good. Regarding EC2 usage I had provisioned in our budget for a couple of micro instances running 7/24 so I think we are good. The more days in free trial the better, but I'm covered anyway. I still think that the page https://hub.turnkeylinux.org/pricing/ is not as clear as it should be, mixing Amazon pay-per-use with TK fixed plans. Or at least is not clear enough for us non-native English speakers. there is no turnkey plan where you are billed from turnkey directly. the ec2 servers are super confusing if you look at amazons pricing page. Now I'm lost. I understand that TK don't bill directly by themselves, but I can't relate what TK says by "depending on which plan you choose " (see the url) with some Amanzon price pages. Are they talking about Amazon Reserved Instances? Because, let's take the "Budget plan" at $20.- per month, that's $240.- per year. That corresponds to what AWS service? Sorry for the confusion. When you reach the plans page from within the Hub you don't just get a static image of the plans. That image is a screenshot of the plans page and each of the items on it (e.g., the monthly price, the usage fees, etc.) is a actually a link which brings up an explanatory pop-up. We tried to make it as clear as possible but there may still be room for improvement. If you choose the Hobby plan there is a usage fee percentage premium for each instance hour you run. The usage fee premium goes to TurnKey, the rest goes to pay your regular AWS instance usage fees. In the Hobby plan you can only run S3-backed 10GB instances and miss out on various features such as reserved instances, snapshots, etc. that are not supported by S3-backed instance types. OTOH, there's the the budget plan that lets you deploy EBS-backed instances. 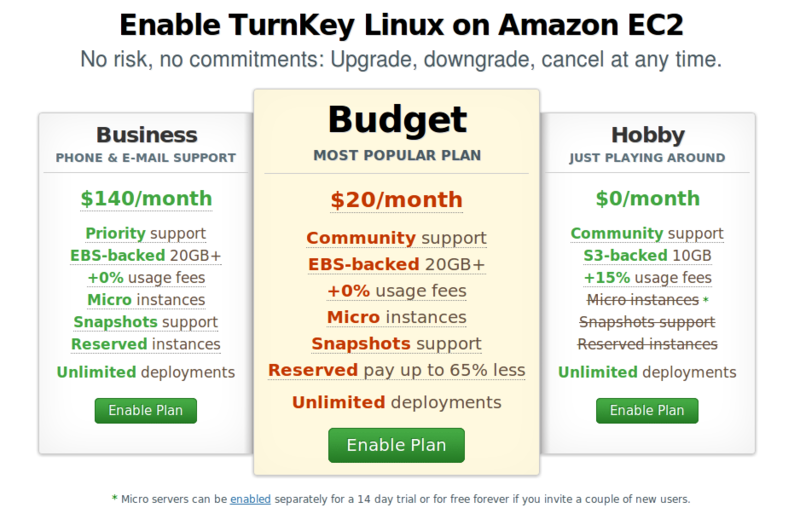 It lets you run TurnKey images as EBS-backed images with no premium on the regular Amazon usage fees. In exchange you pay a fixed $20/month. I recommend if you haven't done so yet you sign up for an account and then explore the plans page interactively by clicking on various items you want clarified. Don't be afraid of that page. It's not like you can sign up to a plan by accident. Even after you click to Enable you still have to go through an Amazon checkout page that explains the exact details of the transaction.